Recently re-elected Iranian President Hassan Rouhani lashed out at the Trump administration this week, describing it as ignorant and saying that Iran "needs missiles" to confront the United States and its allies, according to recent remarks certain to rile leaders in Washington, D.C.
Just days after President Donald Trump blasted the Islamic Republic for its illicit ballistic missile program and support of terrorism in the Middle East, Rouhani confirmed that Iran would not cease its missile activity, despite repeated calls by U.S. officials. 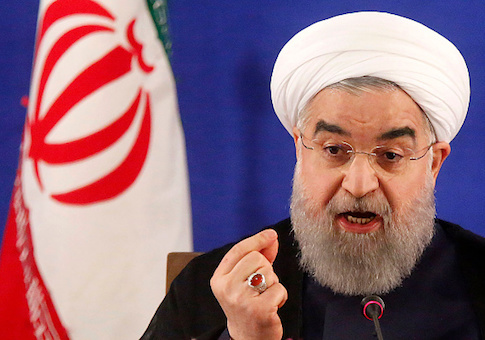 "We need missiles and the enemy should know that we make everything we need and we don't pay an iota of attention to your words," Rouhani was quoted as saying on Wednesday during a meeting with Iranian cabinet members. "The remarks by the enemies of the Iranian nation against Iran's missile power are out of ignorance." The Iranian leaders remarks support recent comments by senior military leaders in the country, who have repeatedly declared that Iran will "never stop" developing ballistic missiles, a program that has raised concerns with the U.S. intelligence community, which assesses that Iran's missile program could be used to carry a nuclear weapon. The remarks came as Iran announced the construction of a third underground ballistic missile production factory, helmed by Iran's Revolutionary Guard Corps, or IRGC. Iranian General Amir Ali Hajizadeh, and IRGC leader, said the factory is meant to boosts Tehran's "missile power" and intimidate the United States and "Zionist regime," or Israel. "We will increase our missile power. Our enemies, the United States, and the Zionist regime (Israel) are naturally upset and get angry at our missile production, tests and underground missile facilities because they want Iran to be in a weak position," Hajizadeh announced on Thursday. The facility was built in the last few years, according to the IRGC. Iranian military leaders also are working on building Iran's first "ground-to-ground" ballistic missile. Iran's repeated test firing of ballistic missiles, as well as its multiple space launches—which are believed to be cover for an intercontinental ballistic missile program—have riled the Trump administration and leaders of both parties on Capitol Hill. A bipartisan delegation of nearly 50 senators announced on Thursday that it is moving forward with new legislation to increase economic sanctions on Iran as a result of its missile program, as well as the Islamic Republic's support for terrorism and illegal weapons trade. Sen. Robert Menendez (D., N.J.), a chief sponsor of the legislation, said that it is part of a larger effort to ensure that "Iran's leaders understand they do not enjoy blanket impunity as the United States continues to live up to its commitments under the" nuclear agreement. "Independent of the nuclear portfolio, and as President Rouhani starts his second presidential term, our broader policy towards Iran must be one that holds Tehran accountable for their destabilizing efforts in the region, illegal and dangerous missile technology development, and nefarious activities as the world's leading sponsor of terrorism," Menendez said. "As the administration continues to review its Iran policy, Congress must set out clear markers that impose real consequences to Iran's illicit behavior that runs counter to our national security and that of our allies in the region." The legislation would impose mandatory sanctions on all individuals associated with Iran's ballistic missile program, as well as those who perform transactions with them. Sanctions also would be applied to those who support Iran's terror operations, including the IRGC, which is not currently designated as a terror organization by the United States. The legislation also requires President Trump to block the property of all individuals and entities involved in supplying, selling, and transferring prohibited arms and other weaponry to Iran. A State Department official, speaking on background, told the Washington Free Beacon that the Trump administration is moving closer to finishing its comprehensive review of the Iran deal and dealing with Iran's provocative actions in the region. "As Secretary [Rex] Tillerson said, the Trump administration is currently conducting a comprehensive review of our Iran policy," the official said. "Once we have finalized our conclusions, we will meet the challenges Iran poses with clarity and conviction." One veteran foreign policy adviser who is close to the White House told the Free Beacon that the Trump administration would not stand by as Iranian leaders mock and threaten the United States. "The Obama administration treated the Iranians with kid gloves because that was to get the nuclear deal," the source said. "That ended last January but the Iranians are still acting as if they have a friend in the White House. They threaten and mock the United States, our leaders, and our allies, and they expect us to roll with it. This president is not going to roll with it, and neither is Congress." Meanwhile, senior Iranian military leaders continue to criticize the Trump administration for its efforts to stop Iran's missile program. Iranian Armed Forces Brigadier General Massoud Jazzayeri offered harsh words for Secretary of State Tillerson following his call for Iran to cease its ballistic missile work. "The U.S. secretary of state's expectations of the Iranian president indicate the U.S. officials' non-understanding of the Islamic Republic of Iran," Jazzayeri was quoted as saying in the country's state-controlled press. Update 1:18 p.m.: This post has been updated with more information. This entry was posted in National Security and tagged Hassan Rouhani, Iran, Trump Administration. Bookmark the permalink.